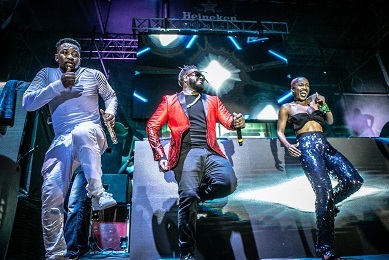 American rapper, Faheem Rashad Najm, better known by his stage name T-Pain was recently in Nigeria where he delivered an electrifying performance at the “Live Your Music’’ party which was announced as the official after-party for #HeinekenLFDW2016. T-Pain took to the stage to perform some of his hit tracks “Buy You A Drink”, “Panda”, amongst others during his first session. He was also pictured doing the Shakitibobo dance on stage.